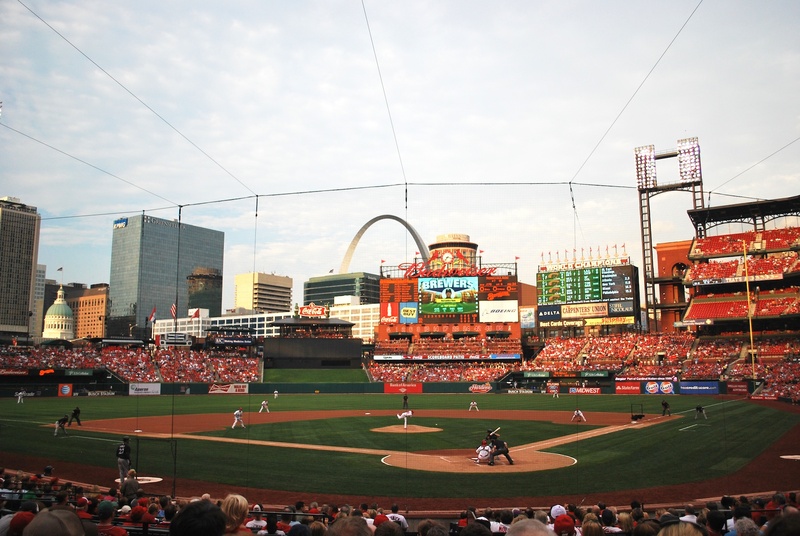 I had driven down to St. Louis on Thursday afternoon and arrived at my Aunt and Uncle’s place at 7:50 PM. I wasn’t awere of the Megabus accident until Anne told me about it when I arrived. It happened on I-55 South (the route I took) but about five hours before I reached that point on the interstate. There was one fatality and it’s a very unfortunate accident. 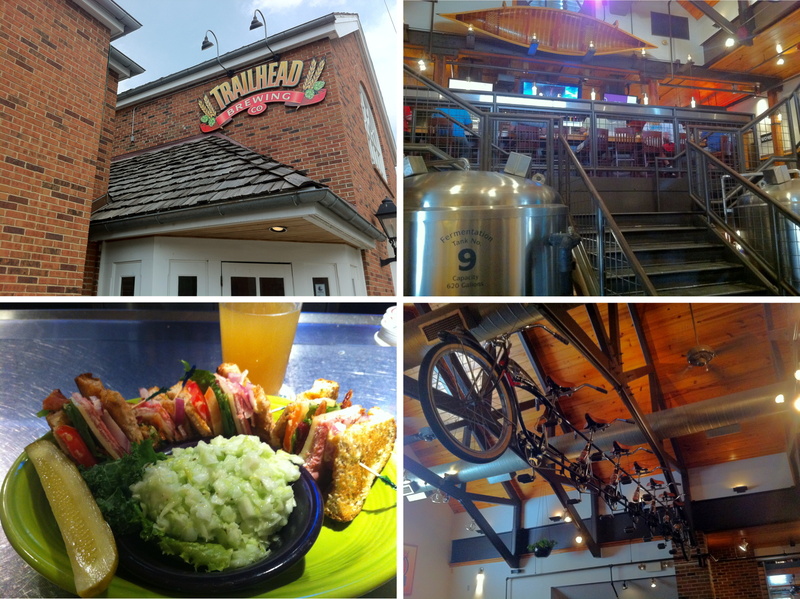 1) The exterior of Trailhead Brewing Co., located in St. Charles, MO. 2) The view from just inside the entrance. I sat up at the bar, beneath the canoe, and in front of the three TVs that all had different Olympic events on; jackpot. While I was there I watched some water polo, women’s soccer, table tennis, badminton, swimming, and rowing. 3) The seven person bike that was suspended from the ceiling across from the canoe. 4) My lunch; I had the St. Charles Club which consisted of Turkey, Ham, Bacon, Prime Rib, Swiss Cheese, Lettuce, Tomato, and Chipotle Mayo on Toasted Multi-Grain. I added red onion and chose the Cole Slaw as my side. Marvelectible! I left Trailhead at 3:15 after about two hours of eating, drinking (2 beers), and spectating. I went back to Anne and Mike’s to get ready for the game. 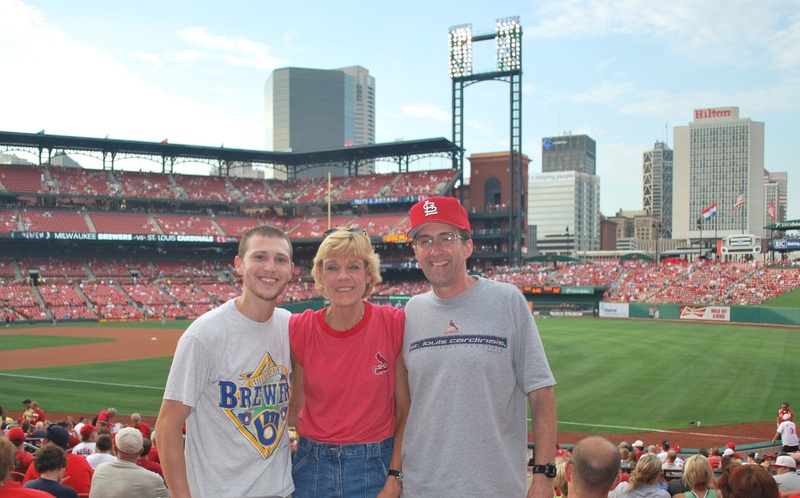 Mike had been given two tickets to Friday’s game so the three of us went together. Mike drove us to the North Hanley Metrolink stop and we took the train in. 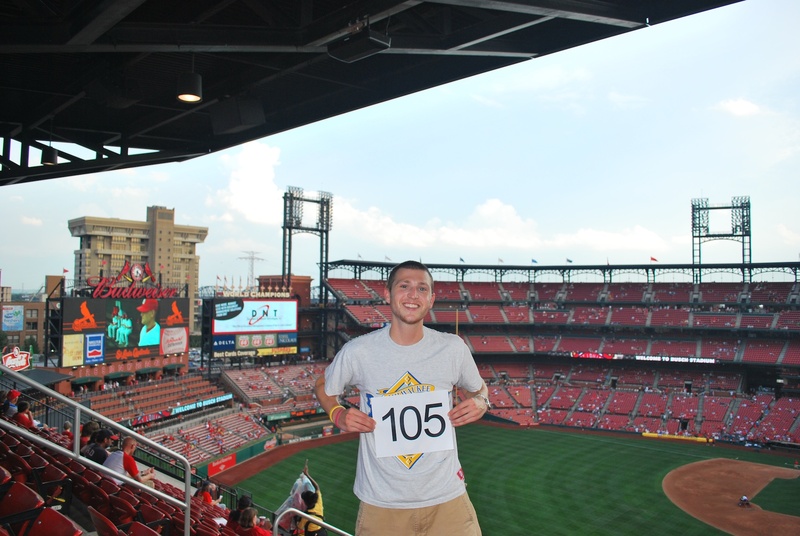 We got to Busch Stadium just before six, I picked up my ticket from will call, and we went inside. I went to the upper deck to get the game number picture while they went and got something to eat. 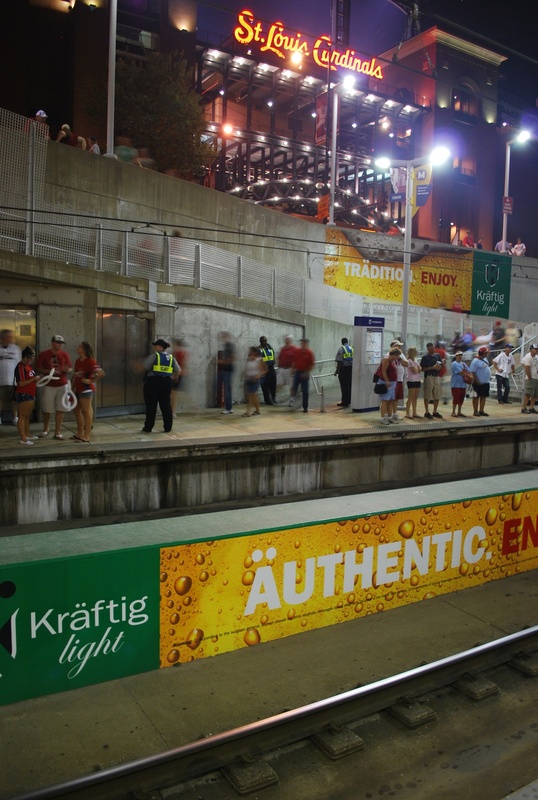 The guy who I had take the picture (Kevin) was not wearing Brewers apparel but happened to be from Mount Horeb, WI. Mount Horeb is pretty close to Victoria’s and my apartment on the west side of Madison. Small world. He said they were Red Sox fans and I didn’t ask why. After thanking Kevin and telling him about what I was doing and why I went down to the field level. I took an elevator and right next to it there were ice chests where they store the ice for vendors. I looked inside and they were empty but they were still on. I was tempted to climb inside and take a nap, it was that hot. I got down to the field level and tried talking a cameraman into seeing if his producer wanted to interview me during the game. It worked in Philadelphia so I figured I should try it elsewhere as well. He said he’d mention it but unfortunately nothing ever came of it. I found out on Friday that the Sunday game is a 7:05 PM start and will be broadcast on ESPN. I had in my calendar that it was a 1:15 start. I’m not too happy about it because I probably could’ve been back home in Wisconsin by the time the 7:05 game is going to get over. It will give me a chance to talk to one of the ESPN cameramen and try to get an interview (even though it’s extremely unlikely). I went to Anne and Mike’s section and had a nearby fan take a picture of the three of us. I know I didn’t sit with them at the game but they are my hosts and deserve some credit. Opening their home for 10 nights this season helped make Mission 162 possible and I am very grateful. Thank You! 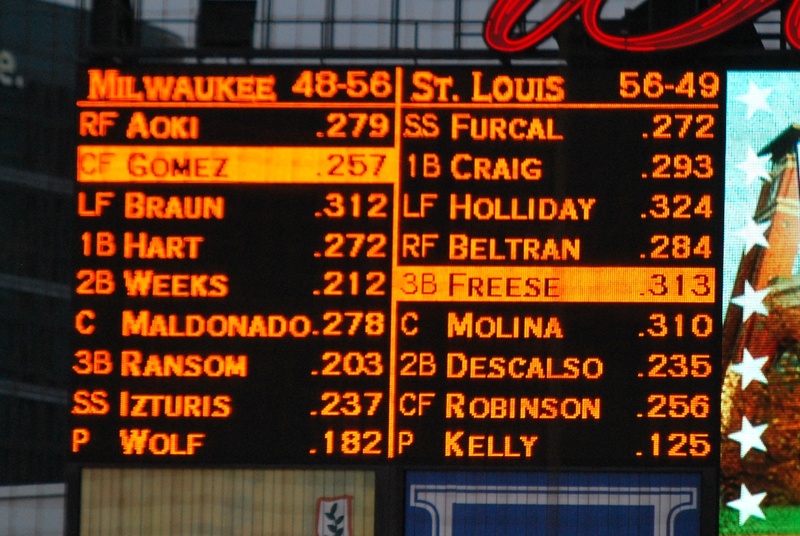 With that record the Brewers would have *only* been 8 games back at the start of the game, as opposed to the 15.5 back that they actually were. A little bit later they changed the Brewers record to something that has a slightly worse winning percentage than the first, but it is three more wins! In the top of the second the Brewers loaded the bases with only one out. 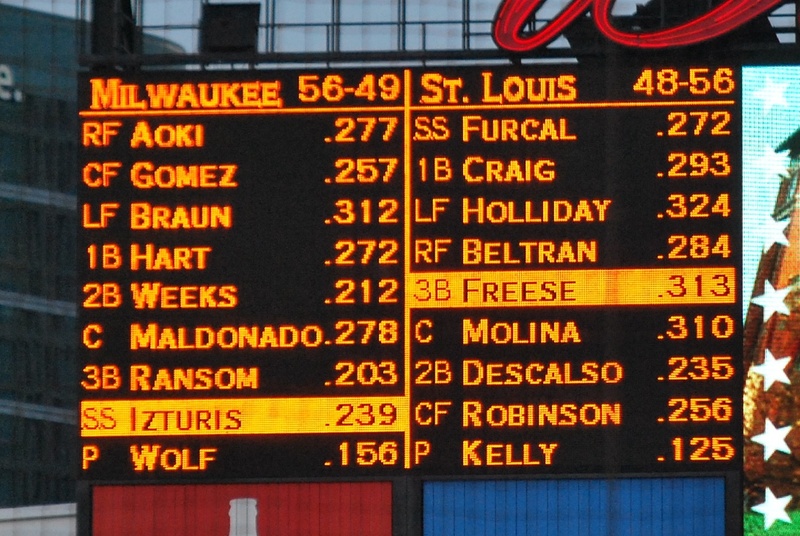 Izturis grounded into a force out which brought up Randy Wolf to try and help his own cause. On a 2-1 pitch he lined a base hit to right field that drove in Maldonado and Ransom. As you can tell the pitch was high but Wolf got the job done. 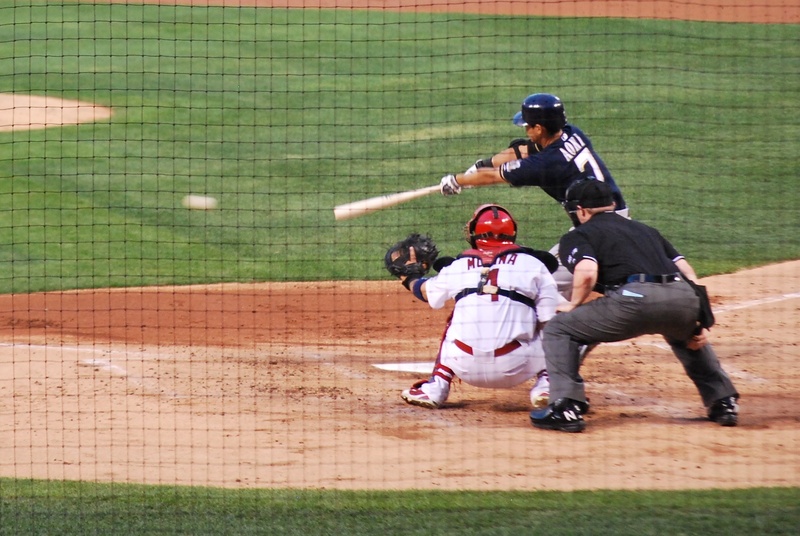 Aoki followed Wolf with an RBI single to left field. Here he is just after he slapped it towards the hole. Four errors is not going to get it done on most nights. 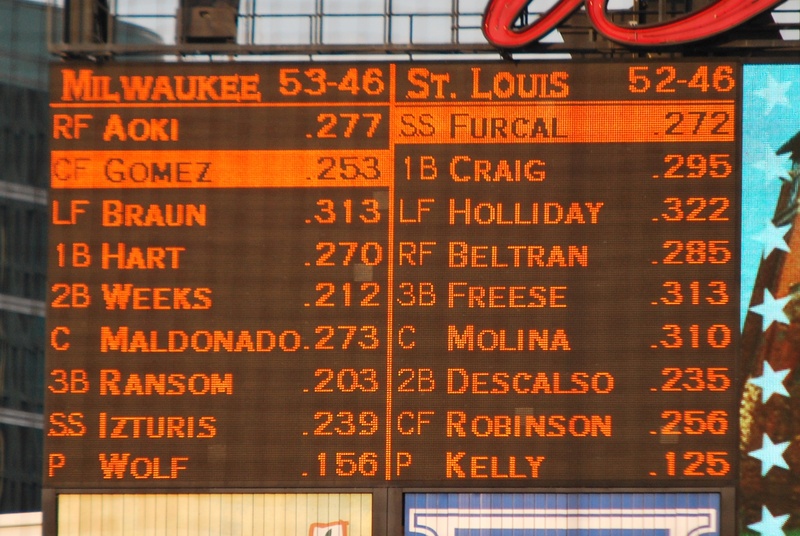 It was reminiscent of the NLCS last year when the Brewers had 7 errors over the last two games of the series. 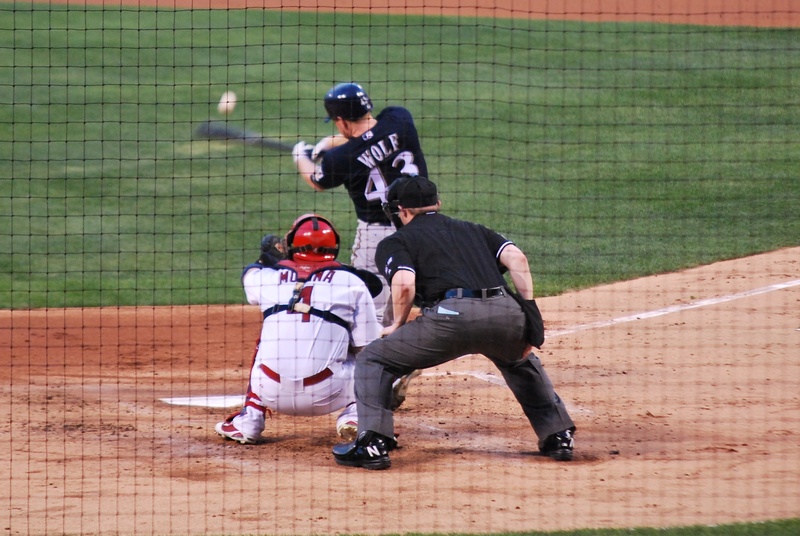 The Brewers failed to score in the ninth and it was the seventh straight road loss for the Crew. Final Score: Cardinals 9 – Brewers 3. Braun went 3-5 which was probably the highlight of the night. Cardinals fans might be the second worst behind the Dodgers fans in terms of Braun’s treatment. 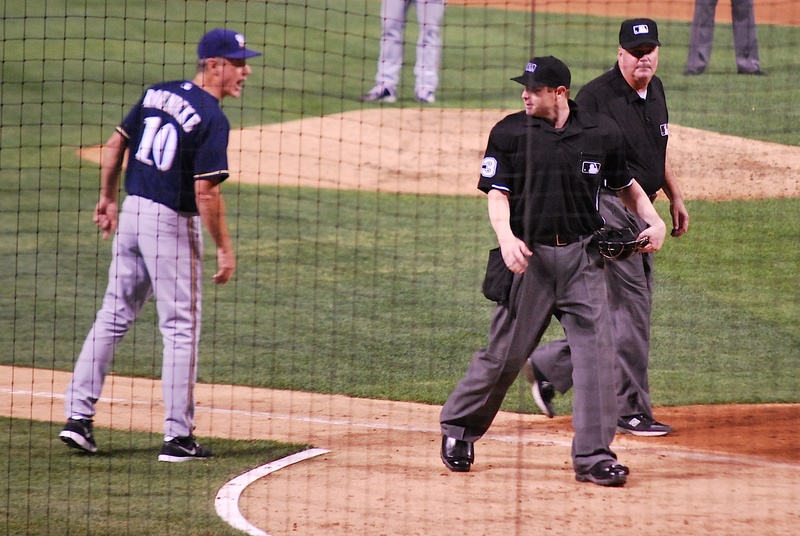 There were some really loud boos and who knows what was said in the bleachers while he was in the field. It’s funny because I’m pretty sure the Cardinals had a guy by the name of Mark Mcgwire who obviously took steroids and eventually admitted to using them. Braun has done neither and is having a better season than last year. That’s without Prince Fielder behind him in the lineup WHILE being under a microscope and viewed as a cheater. It rained pretty hard this morning and right now there are thunderstorms and rain in the forecast for the rest of the day. There is between a 40 and 60 percent chance of rain from now until midnight so we’ll see what happens. Tomorrow is supposed to be nice and since a night game is already scheduled I wonder if they would consider having a doubleheader if today’s game is canceled. I want to see a doubleheader at some point in my life and I know it’s not going to happen at Miller Park unless the roof fails to close.